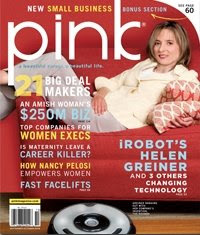 Wachovia Corp. made Pink magazine’s second annual list of Top Companies for Women in the ladies mag's September/October issue. I would've put the Charlotte-based company at the top of the list with my own unscientific research. Everywhere I go around Charlotte I meet lots of women who are employed by either Wachovia or Bank of America (apparently Wachovia treats its women better). They're half the reason after-work networking events are so popular here. Pink did its research, though. It picked companies based on the number of women reporting to the CEO, how quickly the ranks of women in middle and senior management are growing, upward trends in women among the highest earners, and several other criteria. Thirteen companies made the list. The others are American Express Co., Bebe Stores Inc., FedEx Services Inc., Grant Thornton LLP, Heller Ehrman LLP, KPMG LLP, Liz Claiborne Inc., Manpower Inc., MetLife Inc., Ogilvy Public Relations Worldwide, Turner Broadcasting System Inc., and UPS. Get your resumés together, ladies.